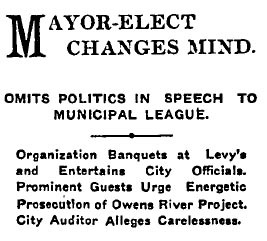 Mayor-elect Arthur C. Harper stood before 200 members of the Municipal League and their friends in a dinner at Levy’s who were eager to hear what he planned for his incoming administration. Harper took his typewritten speech from his pocket, showed it to the crowd, and laid it aside. Harper said he changed his mind “and would wait a little longer before telling the public exactly what he intended to do,” The Times says. In brief comments, Harper promised to look at every department in city government and said he had complete faith in the Owens River project. The star of the evening was William Mulholland, the moving force behind the Los Angeles Aqueduct, who received a five-minute standing ovation. J.A. Anderson, head of the Board of Public Works, pleaded for unity among the branches of government, while City Auditor W.C. Mushet urged the council to study accounting systems of other cities and adopt one of them to ensure better financial reporting. It turns out that Mayor Harper indeed has plans, but they involve kickbacks from one of the local heads of the underworld involving profits from a bordello in the Tenderloin. 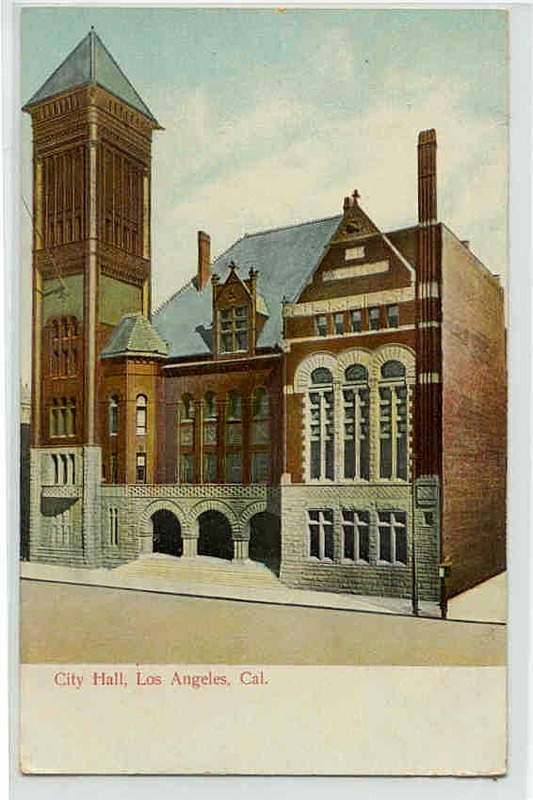 Above, City Hall on Broadway, located on what is now the vacant lot next to the Victor Clothing Building, which was originally built as a City Hall annex.